I’m back with my final post as a guest designer. It has been so fun working with D2BA’s fabulous stamps! Thank you for having me! Well, I couldn’t resist playing with this adorable llama from Spit Happens, again. It’s amazing how different he looks, though, just by changing my color scheme. 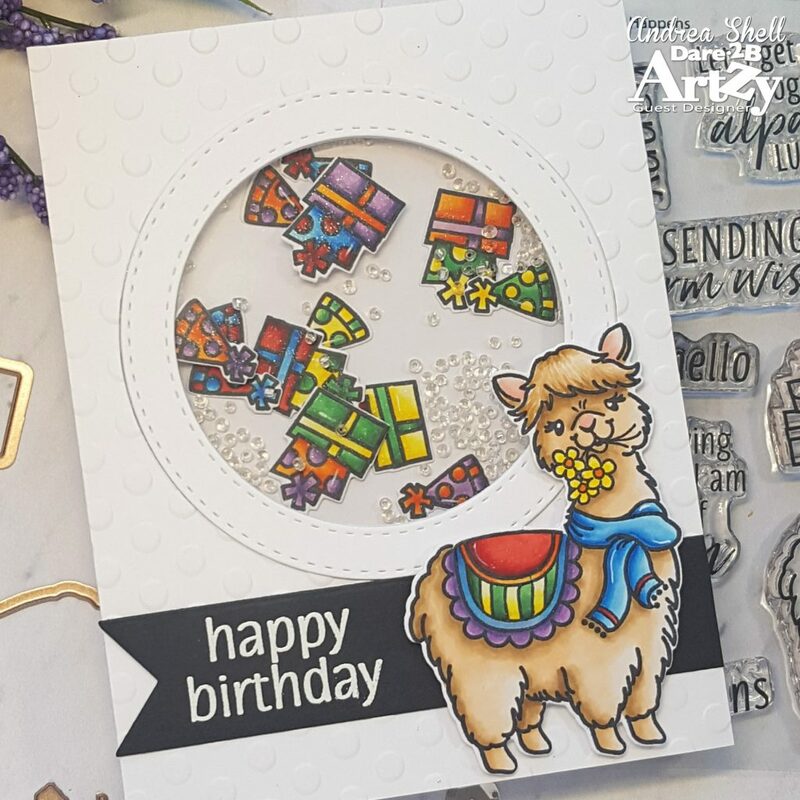 I love how you can breathe new life into a stamp set or extend a stamp’s life simply by using different colors! This time I went for rainbow colors (I know a certain ‘tween who’s going to love this card!) and just had fun coloring. I stamped all of my images with Memento Tuxedo Black ink, colored them with Copics, and die-cut them with the coordinating dies. I added white highlights with a gel pen and brushed on lots of clear sparkle. 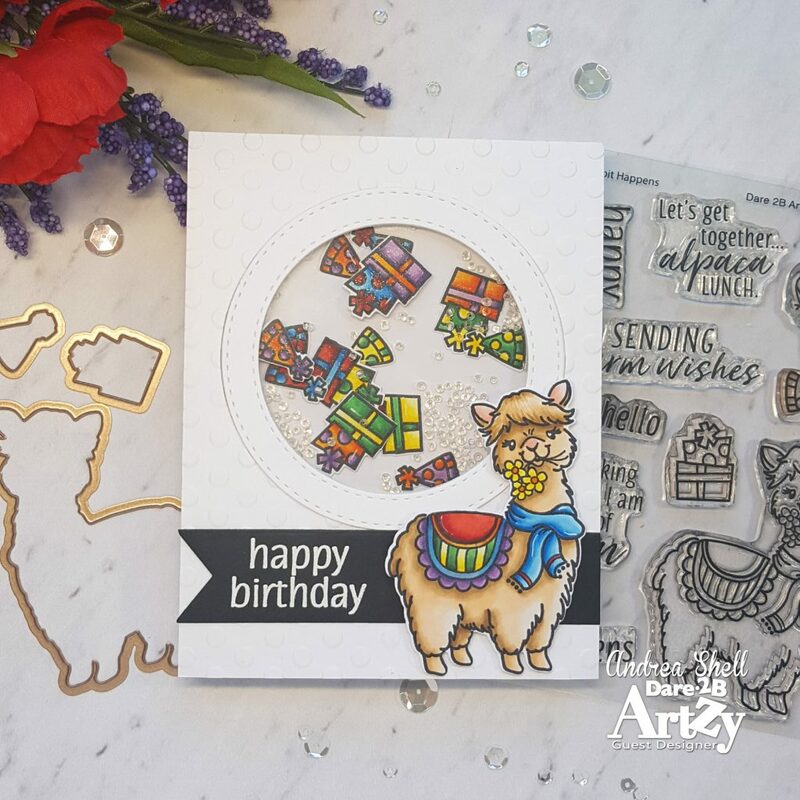 What could be more fun than a rainbow-hued llama card? Why, a rainbow-hued SHAKER card, of course (Why else would I color that many hats and presents? )! To keep the focus on my images, I kept the rest of the card neutral. An embossed background prevents it from being boring, however. I backed my front panel with two layers of foam tape and made sure to hit the edges of it with an anti-static tool to allow my images to move around more freely. For some interest and more sparkle (Is there such a thing as too much sparkle? Nah! ), I added clear seedbeads to my shaker. I die-cut a flag from black cardstock and white heat-embossed a sentiment from Spit Happens. 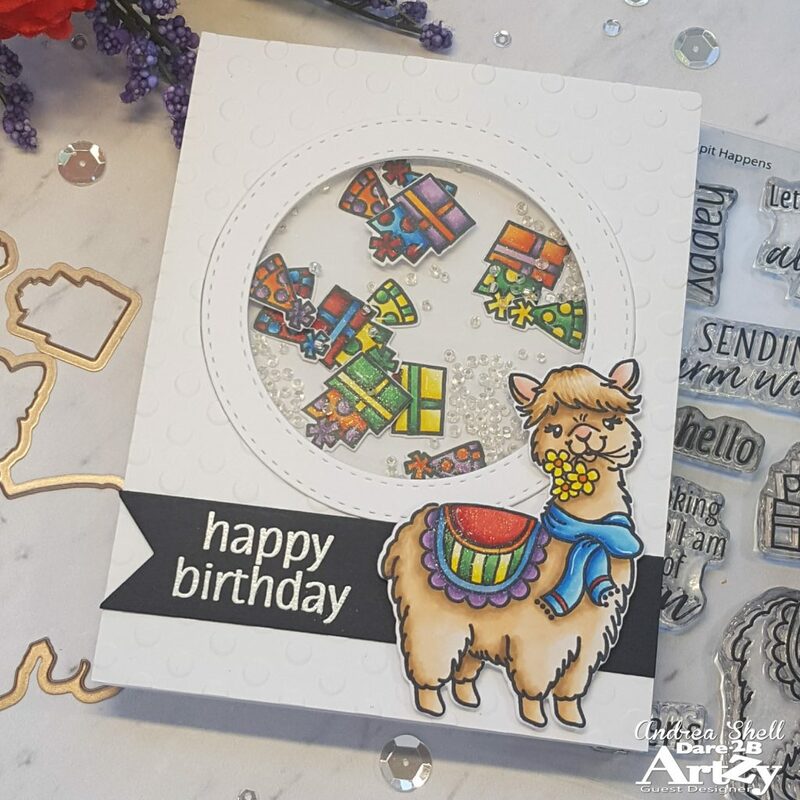 After adhering my sentiment to my card, I popped up that adorable llama with foam tape. He definitely steals the show, don’t ya think? Have a great week! Don’t forget to enter D2BA’s August Challenge of Anything Goes. After the awesome release they just had, who wouldn’t want to win a free stamp set? !